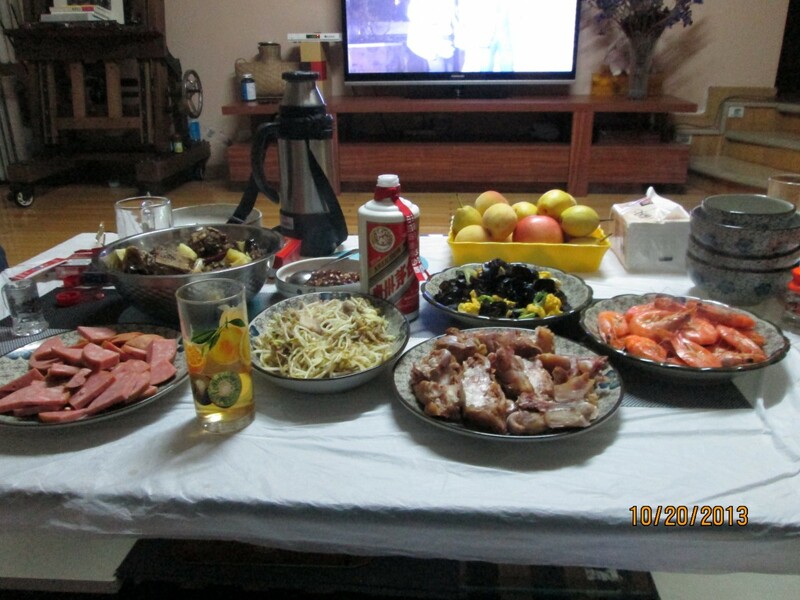 In Changchun I have been able to try some unusual traditional foods. Since my arrival here in Changchun I have been able to try some unusual traditional foods. My second day here I was taken to Mount Changbai near the North Korean border. Changbai Mountain is an active volcano 9003 ft. high with a caldera at the top partially filled with water. The lake is up to 1200 ft. deep. It is known to erupt every 100 years or so and the last eruption was in 1903. It’s a famous tourist spot because many believe the mountain is the place of their ancestral origins. It has been a destination for pilgrims since early imperial times with a history of many visits by emperors. This mountain is about 500 kilometers from Changchun which is about a seven hour drive. Along the way we stopped at a few local restaurants. 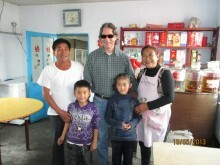 I have never been in one of these small eateries where the food wasn’t good. A small Islamic restaurant that we visited on the way to Mt. Changbai was no exception. It was very small with one table inside and one outside. 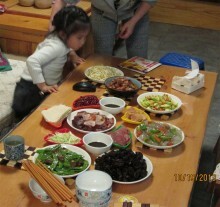 Obviously a family business, instead of a menu we went to the kitchen to choose our pieces of meat and fresh vegetables. Being Islamic they only served mutton but everything was prepared fresh while we waited. It was delicious. 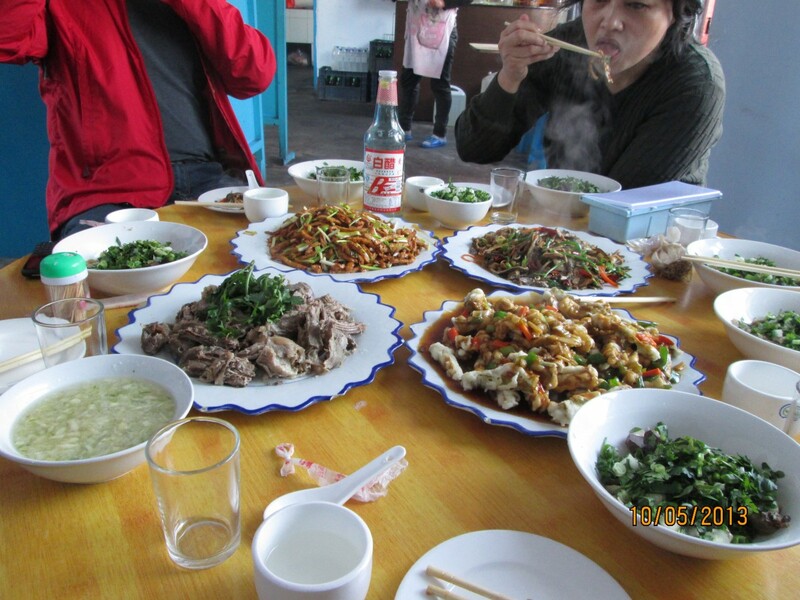 One of the items we had was a spicy meat and vegetable dish with sheep tripe. It was very good. There is a type of bread in this area that is like a thin pancake. It is torn and eaten separately or rolled with food like a mini burrito. The two giggling children of the family peeked at me from around doorways and had probably never seen a foreigner before. After the lunch that I enjoyed immensely they agreed to a photo. The family was very gracious and we left after an excellent and inexpensive lunch. Local fungus were served that are black in color. That same evening we were invited by the sister of one of the professors in our party to a restaurant in Jingyu. In all there were about 15 people at this dinner and as always the meal was sumptuous. Local fungus were served that are black in color and don’t have much taste but I was told that they are good for your circulation and heart. A spicy eggplant and potato stir-fry was very tasty but my favorite was a spicy stew of celery, potato, hot peppers and whole forest frogs. The frogs, I was told were very good for your skin and joints. It was mentioned that the frog skins were so durable that you could bury one in the ground and dig it up years later and there would be no decomposition. In addition there were roasted pork feet and barbequed chicken feet, typical of a dinner for guests there was an overabundance of food. The northeastern Chinese diet is varied and interesting. The most popular dish in this part of China is dumplings. They are usually made with a wheat flour dough on the outside and pork and vegetables inside but there are many different kinds of fillings. They are boiled and then sometimes fried. Chinese dumplings are very similar to Polish ‘perogi’ everyone makes them a little differently but they are all very tasty. I was told that they are made with all different kinds of meat including donkey, horse, venison, sheep and dog. The dog dumplings are supposed to be very good and also popular but I don’t think I have the courage to try them. I have been invited many times to people’s homes for dinner and I enjoy this very much. 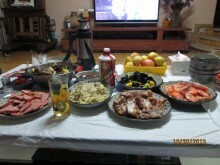 I am sure that they want to impress me with Chinese cuisine so the hosts prepare many dishes. The two photos below are of dinners with professors at the Art Department. The main dish which hadn’t arrived yet when I took the photos was dumplings. The northeastern Chinese diet in is varied and interesting. There are many things similar to other cultures such as the dumplings but there are also many items that one doesn’t find elsewhere such as the black fungus and forest frogs. I look forward to trying many different traditional Chinese foods during my stay in China.